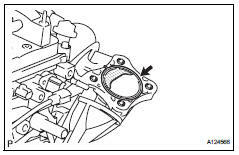 Remove the 2 nuts and engine cover. Disconnect the mass air flow meter connector. Disconnect the purge vsv connector. Disconnect the 4 wire harness clamps. Disconnect the no. 2 Ventilation hose from the air cleaner hose. 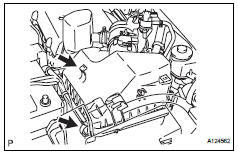 Disconnect the purge line hose from the clamp. Lock the no. 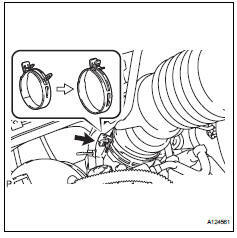 1 Air cleaner hose clamp, and then disconnect the no. 1 Air cleaner hose from the throttle body. Unfasten the 2 hook clamps, and then remove the air cleaner cap. Remove the air cleaner filter element from the air cleaner case. 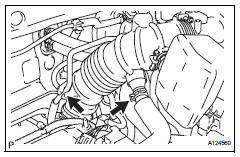 Disconnect the purge line hose from the throttle body. 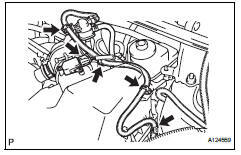 Disconnect the water by-pass hose from the throttle body. Disconnect the no. 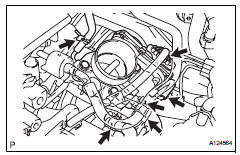 2 Water by-pass hose from the throttle body. 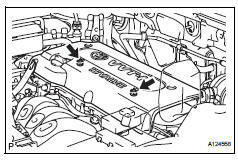 Disconnect the throttle position sensor and control motor connector. Disconnect the wire harness clamp. Disconnect the fuel tube from the clamp. 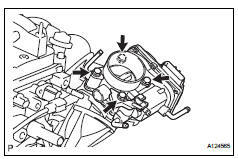 Remove the 4 bolts, and then remove the fuel pipe support and throttle body.